Around springtime each year, the housing market explodes with a proliferation of new houses being put on the market. Buyers are ready to get out, enjoy the warm weather, and hunt for the perfect house. Landscaping can have a huge effect on the curb appeal of your home, so if you’re hoping to sell this spring, it’s important that your yard be up to snuff. Use these tips from Edward Gosman & Associates to make sure your home stays in the running. Outdoor lighting continues to gain popularity as a desirable landscaping feature. One application it’s often used for is safety; solar lights lining the driveway or LEDs lighting up steps can prevent a nasty trip and fall. In addition, the right lighting can be used spotlight certain attractive features of your home, like a stunning window or beautiful landscaping. It also has the benefit of reducing crime in your neighborhood since the added illumination tends to discourage burglars. While it’s important for your landscape to incorporate an assortment of trees, plants, flowers, and shrubs, the ones that you choose can have a big impact on your time and your wallet. Imported plants that are not native to your region take a lot more time, energy, and money to maintain. Native varieties, however, require a lot less water and very little care and maintenance. As a bonus, they also provide shelter for the small animals, birds, and butterflies in your area. Another sought-after feature that buyers tend to look for is the presence of an outdoor seating area that can be used for gathering and entertaining. From fire pits and outdoor fireplaces to romantic gazebos, people love having an outdoor oasis where they can unwind after a long day at work or gather with family and friends. Even if you don’t have something as fancy as a gazebo, having some kind of deck or patio will add value to your home and attract buyers. 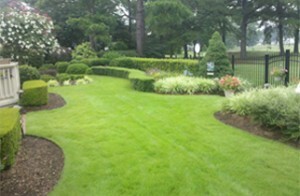 At Gosman & Associates, we have the know-how to design the perfect landscape for your property. Give us a call today at 757-421-2500 to set things in motion, and buyers will be lining up to see your home in no time! This entry was posted in Yard Enjoyment on April 21, 2017 by Edward Gosman & Associates.